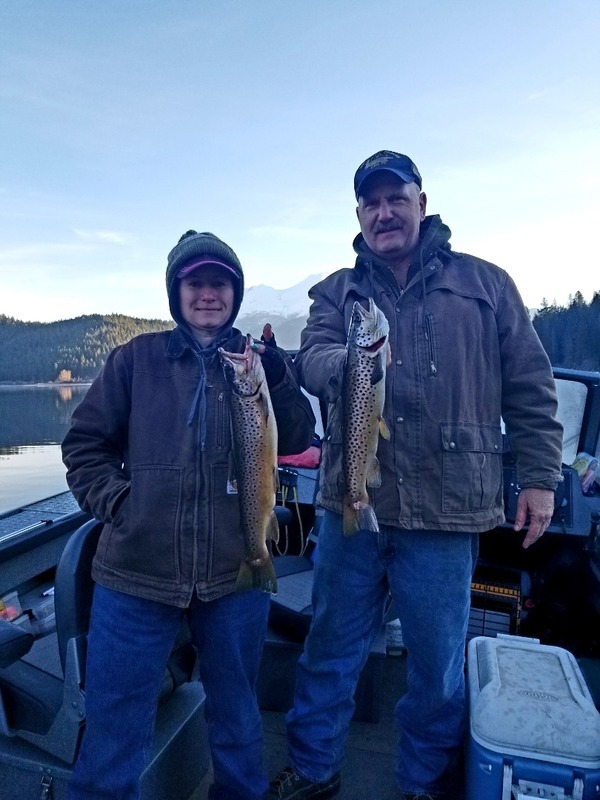 3/20/19 - Father an Son waded through just about everything Mother Nature could throw at us on Shasta Lake today and both came away with lifetime best ever Trout, fatty hard fighting Brown Trout awesomeness!!! It was windy it was rainy it was cold all we needed was some snow to top off the day. Thank goodness that didn't happen but with that said it was a recipe for Big Trophy Brown Trout. These fish often feed in the worst conditions and if your willing to fight through the conditions you might get rewarded. 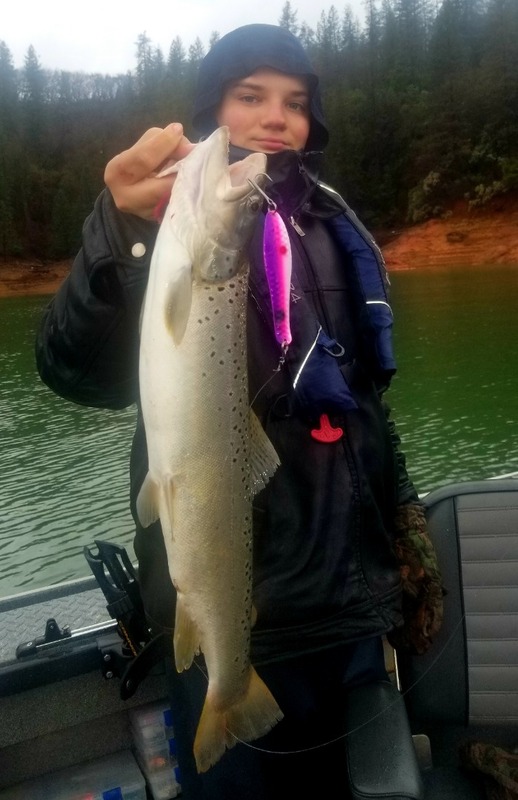 Big Browns like any big fish get that way cause they are smart and on a large body of water it can make even harder to find them. 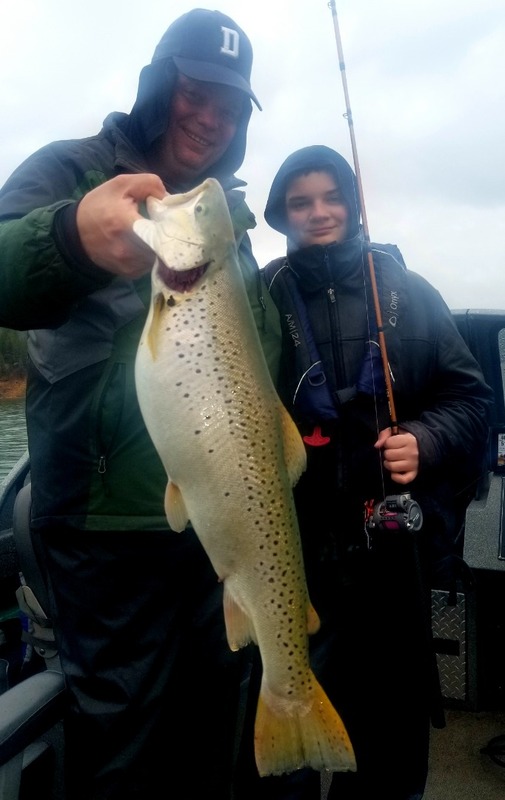 Robert and his son Reagan weathered a pretty good storm and hours of no bites but were both rewarded later in the day for there efforts. Trolling plugs and Optimizers at 4 mph, sometimes faster and sometimes slower you can cover quite a bit of water. Let me tell you we covered some water looking for biting fish. It all happened later in the day, we could have slept in but you know of you do the bite would have been happening haha. For about 2 1/2 hours we found the action we were looking for we got some ripping bites and some solid hook ups. Browns Rainbows Spotted Bass and even a small Salmon hit our offerings, all of which were coated with Pro- Cure Bloody garlic Tuna. Let me tell you, if you haven't used this stuff, then you don't know how smelly or how makes your hands smell using it haha. It is rough on the nose but really does make a difference. Covering a lot of water and keeping your lures in the top 20 feet seems to be the best way to get bit right now. The lake is stained but not so bad you can't fish and the surface temps are nearing 50 in places. We found fish in deep water and near the shoreline edges. 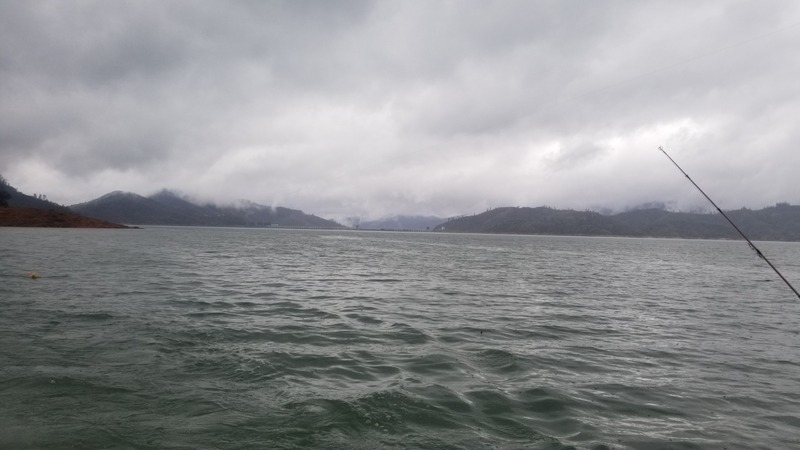 There was no great pattern but if your searching for those big Trophies they do love shallow structure on the edge of deep water especially this time of year. We caught fishing one Brown over shallow water and one over deep water and the same went for all the other fish. Some in deep and some in shallow but all were caught after lunch trolling fast and near the surface. 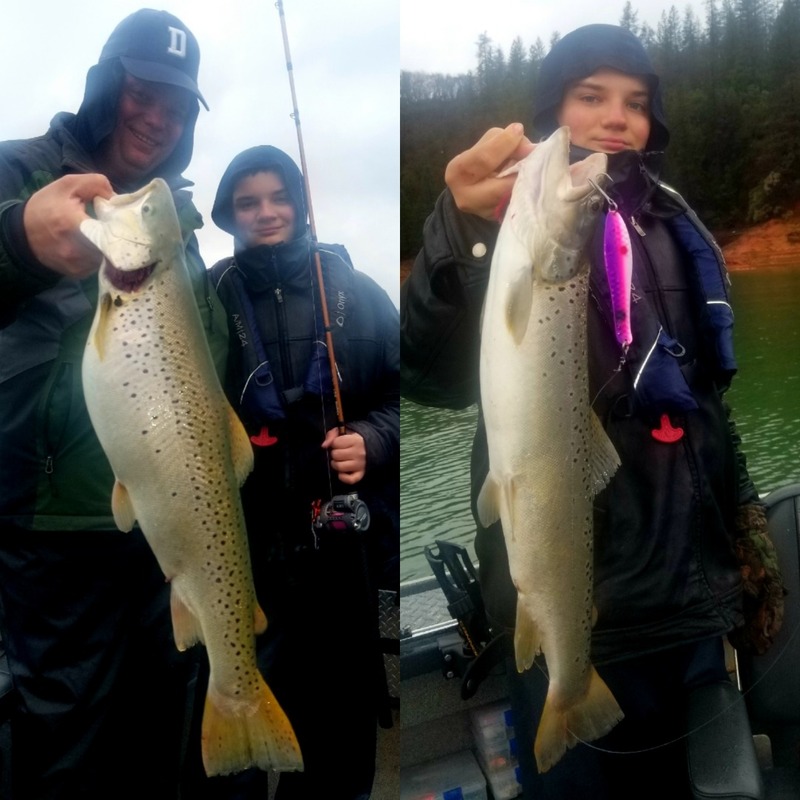 The Browns were the big prizes both well over 20 inches and both over 4 pounds with the big girl being 7 plus pounds. Both fought hard and ripped drag. Making that draft clicker sing is the best sound in the world when they hit. 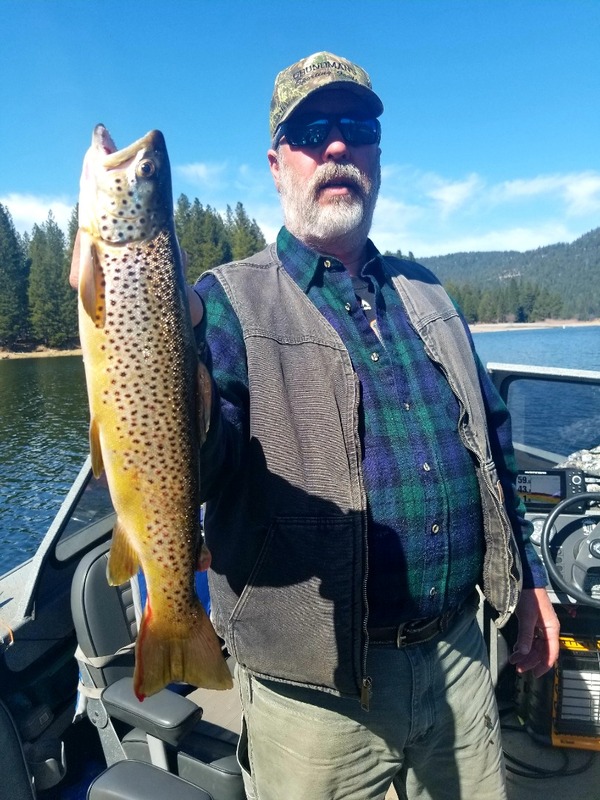 Those of you who grew up on the ocean with good old jigmaster know the clicker sound I'm talking about that is the trolling drug especially when a Trophy Shasta Lake Brown makes it sing.